Mountain views, beautiful sunsets, internet to Bear is an ideal 2 bedroom family-friendly cabin loaded with the complete amenity package to create... VIEW NOW. When you stay in the cabins with a theater room from Acorn Cabin Rentals, you have immediate access to incredible entertainment! Our theater rooms feature huge screens and state-of-the-art audio systems to bring the excitement of the multiplex right to your cabin. With such an amazing feature in your own cabin, there is no need to spend money on expensive entertainment options in Pigeon Forge. Bring some of your favorite movies from home or check out some of the latest blockbuster releases at Redbox. Simply enter “Pigeon Forge TN” when searching for a location and you can browse all of the available movies for rent at the various Redbox kiosks throughout town. No night at the movies is complete without popcorn, candy, and other snacks! While staying in our Pigeon Forge cabins with theater rooms, you have access to a fully equipped kitchen to make all the snacks that you need. Whether you want to prepare a full meal before the movie or have some cold beverages stored in the refrigerator, you will love the convenience of your kitchen. You can pick up microwave popcorn and any other goodies you need from some of the nearby grocery stores in Pigeon Forge such as Kroger, Publix and Food City. When you watch a movie in your cabin’s theater room, it is actually better than viewing a movie at the theater! This is because you don’t have to worry about high ticket prices, noise from other audience members, expensive concessions, and other issues. Whenever you need to take a bathroom break or want to grab a snack, you can simply hit “pause” on your movie so that you don’t miss any of the good parts. After watching just one movie, you will want to stay in our home theater cabins during all of your vacations to Pigeon Forge! Our cabins provide a unique ambiance that fits perfectly with watching a movie in the theater room. If you are watching a romantic movie with your sweetheart, cuddle up on the couch with your sweetheart and enjoy the gentle glow of the fireplace. If you prefer to watch a horror movie, turn the lights down low and have a blanket ready to cover your eyes during all of the scary parts! Whether you want to watch a comedy, action flick, or drama, the ambiance of the cabin just makes the viewing experience more fun. 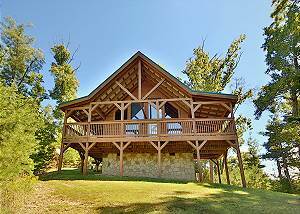 Check out all of our Pigeon Forge cabins with theater rooms today to plan your vacation to the Great Smoky Mountains. We look forward to seeing you soon at Acorn Cabin Rentals!